Every time she started choreographing, Trisha Brown tried to come up with a new vocabulary. But I want to talk about something that stayed the same: Trisha’s love for the body horizontal. Whether it was lying on the ground or being thrust flat out into space (I call it Trisha’s magic carpet), it’s a way to undercut expectations as well as to honor a certain kind of sensuality. As you can see in this video from the Pew Center for Arts & Heritage, I enjoy recalling this image that recurred over the years. Back in 1960 on Anna Halprin’s deck, she whisked a broom handle out so suddenly and forcefully that her body followed it, flying parallel to the deck for an instant. In Walking on the Wall (1971), we got a visceral jolt from seeing bodies, with the aid of harnesses, walking perpendicular to the wall. That image was reprised in the beginning of Set and Reset (1983), when one dancer was held aloft by four others so that she could walk on the vertical surfaces surrounding the stage. Elsewhere in Set and Reset, which slyly camouflaged choreographic preparation, there were startling moments of sudden horizontality. But when we taped this interview at Pew last fall, I wasn’t remembering all the examples of her use of the horizontal. And now they are coming back to me, starting with O zlozony / O composite, a trio originally commissioned by Paris Opera Ballet in 2004 that was performed by Pennsylvania Ballet June 9–12. 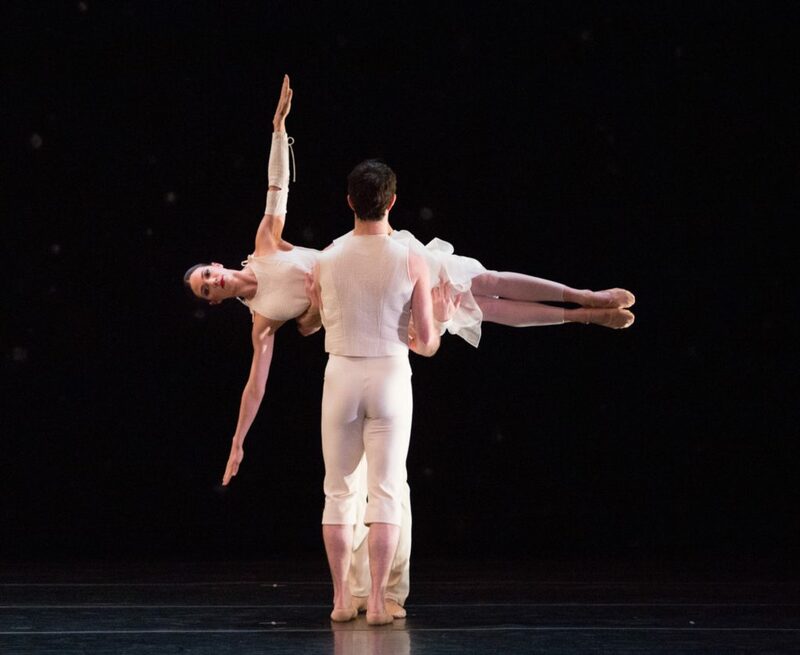 The piece begins and ends with a strong image: The two men find different ways of keeping the woman (in this case Lillian DiPiazza) aloft, and yet it is nothing like a standard ballet lift. As you can see from this rehearsal clip, they work together to maneuver her into an orbiting motion in the air, parallel to the ground. Associate artistic director Carolyn Lucas told me that they call it the rotisserie. But to me, it’s like DiPiazza is dreaming her airborne dream. She could be a slow-motion Superwoman, with cape flying behind her. It’s especially evocative because during this section Laurie Anderson’s sound score has a mesmerizing sensuousness, with a woman’s soft, wistful voice reciting a poem in Polish. There was the time in Lateral Pass (1985) when Randy Warshaw was harnessed to hover over the other dancers, among them but horizontal in midair. Almost like a Chagall figure in the sky twisting his head around to see people on land. During that performance at the Whitney in 1971, Trisha brought Skymap (1969). In this performer-free piece, the whole audience lay down while listening to her voice speaking on tape. Like stargazers at night, we looked up to the ceiling in the darkened gallery and let our imaginations respond to Trisha’s fanciful riff. With her richly multi-timbered voice, she gave words personalities and we “saw” the word h-o-r-s-e gallop across the “map” on the ceiling. We were participating in Trisha’s wittily imagined cross-country trek where words and names had personalities. 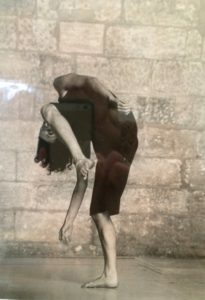 Two other examples of being horizontal on the ground—or on water—are further examples of her synergy between rigor and sensuality. In Group Primary Accumulation (1973), four women on their backs accumulate simple gestures for arms, legs, and head. 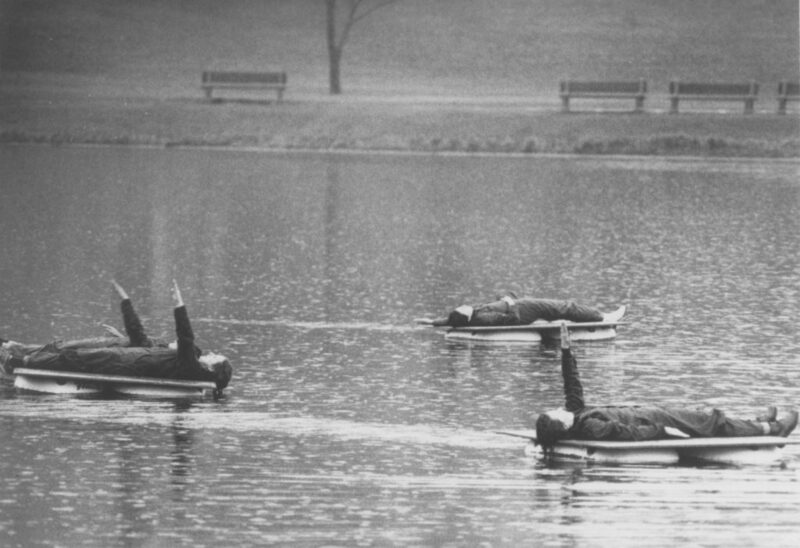 In Minneapolis, she sent those dancers out on rafts in a pond. In her opera L’Orfeo (1998), baritone Simon Keenlyside sang an aria from a prone position. I doubt if any opera singer before has done that before. But, psychically and poetically, Trisha loved the relaxation of the body that let the mind wander. I recently was struck by similarities between the way Trisha challenged us to see the body from unusual angles and the exhibit of the Hungarian Bauhaus photographer/painter/etc now at the Guggenheim. 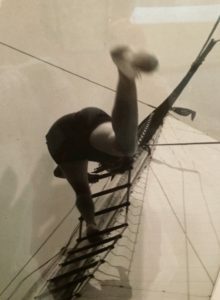 In the photo on the left, taken on a ship in 1928, he looks up through the feet to the rest of the body, similar to the kind of angle I’ve seen in O composite, Newark (1987), and other Brown works. 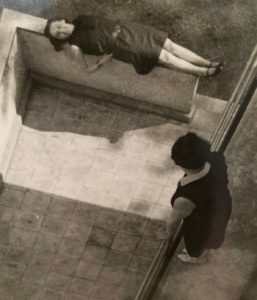 Another Moholy-Nagy photo, where we see a woman lying prone where you wouldn’t expect it, reminds me of Trisha’s ability to place a magic carpet in an otherwise formalist context. However, their order made one ponder the nature of Brown s art and legacy — her moxie as well as her affable charm and her blending of postmodern explorations in painting and sculpture with her expansion of movement vocabulary and her redrawing of convention in postmodern dance.